Representatives from the cities of Dundee, Hull, Leicester and Swansea Bay have made the journey to Londonderry to make their case to become the UK's second City of Culture in 2017. Derry is currently the first UK City of Culture, which the government created in an attempt to replicate the success of Liverpool's year as the European Capital of Culture in 2008. 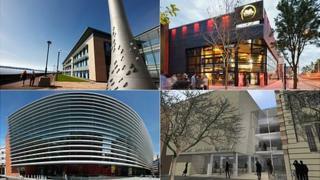 The four cities are hoping the title could bring major arts events, media attention and economic regeneration. But what do the cities already have to offer? Claim to fame: Dundee is famous for the 3 Js - "jute, jam and journalism". During the 19th Century most of the jute mills in India were owned by Dundee firms. The city was also known for the Keiller jam factory, set up by the son of Janet Keiller - rumoured to have invented marmalade in the 18th Century. Journalism is still very much at the heart of Dundee, with publisher DC Thomson still present in the city. Most famous cultural figure: Dundee-born actor and ambassador for the Dundee City of Culture bid Brian Cox. He has appeared in films such as Braveheart, The Bourne Identity and Troy. Most notable gallery or institution: DC Thomson, the publishing company of the Beano and the Dandy. The Beano is celebrating its 75th birthday this year. The town has statues of Desperate Dan and Minnie the Minx, both DC Thomson characters, while the City Council has approved plans to create its own Bash Street in the city's West End, in honour of badly behaved Beano school pupils The Bash Street Kids. Why they should get it: "I think the bid is extremely strong," said Dundee City of Culture bid ambassador Sheena Wellington. "We will all walk on air if we win because it will be us showing the world what a fabulous place Dundee is." Stewart Murdoch, Dundee City Council's director of Leisure and Communities, said: "Our bid is based on the strength of the arts locally and the fantastic participation by people in a wide range of activities." Claim to fame: Hull is very proud of its tradition of independence and freedom. The English Civil War arguably began in the city, when its military governor refused to let the Royalists and Charles I into the city. The abolition of the slave trade also has its roots in Hull, as the leader of the movement was the city's MP, William Wilberforce. His birthplace has been turned into a museum telling the story of the Transatlantic slave trade and modern day slavery. Hull's annual Freedom Festival, which this year attracted 80,000 visitors, began in 2007 to mark the 200th anniversary of the abolition of the slave trade. Most famous cultural figure: Although not from Hull, Philip Larkin lived there for 30 years and found fame as a poet while working as a librarian at the University of Hull. Larkin produced most of his published poetry while living in the city. Hull's bid is partly inspired by his poem Days, with a plan to have cultural events and activities on every day of 2017, the City of Culture year. Most notable gallery or institution: The Ferens Art Gallery broke visitor records with a Da Vinci exhibition last year, which attracted more than 5,000 people in its first week alone. A David Hockney exhibition in 2011 featuring his bright East Yorkshire landscapes also attracted thousands of visitors. The gallery recently bought 14th Century masterpiece Christ between Saints Paul and Peter by Italian artist Pietro Lorenzetti. The £1.6m deal was described as the gallery's most significant in more than 50 years. Why they should get it: "I think we were the surprising inclusion in the shortlist so we must have done something right," said councillor Steven Bayes, who is part of the Hull 2017 bid team. "It would benefit the infrastructure in the city, and it's also about changing perceptions. People will feel more proud of where they live. We've already managed to attract business sponsors, and we haven't even won the title. If the judges want to make the biggest difference to a city, Hull is probably at the top of that list." Claim to fame: The jewel in Leicester's cultural crown is the discovery of the remains of King Richard III. The city has always had strong links with the last Plantagenet king, who died at the nearby battle of Bosworth, but the relationship has been cemented with his discovery. Thousands of people have visited Leicester to see both the site of his burial and an exhibition at the historic Guildhall. And the city is investing millions in creating a permanent museum, as well as a resting place fit for a king. Most famous cultural figure: Richard III is not the only cultural icon - the Attenborough brothers, Sir David and Lord Richard, both spent their formative years in the city when their father was setting up the University of Leicester. Oscar winner Lord Attenborough has formally backed Leicester's bid as the place where he first developed a taste for acting, describing the city as having a "rich cultural vein". His brother David has told the BBC about how the city shaped his love of nature and fuelled his passion for music. Most notable gallery or institution: The city has a host of attractions to entice the visitor, but its top site is the National Space Centre - the largest of its kind in the country. It was created at the turn of the millennium to show off the work of the University of Leicester's Space Research Centre which has worked on missions to space every year since 1957. The attraction is filled with interactive displays featuring rockets, satellites and Martian surfaces. Why they should get it: "Leicester's strength is in its cultural diversity," said mayor Peter Soulsby, who has led the bid. "Our bid comes from the uniquely rich and diverse communities of Leicester. The range of cultural activity taking place in our schools, within our communities and across the city is unrivalled - and the quality and variety of our performing arts spaces is magnificently illustrated by the city's flagship venue, Curve. For too long we've kept our city a secret - it's our time to shine!" Claim to fame: Culturally Swansea Bay can boast key figures from every generation. But poet Dylan Thomas is by far the most famous of them all and is known locally as Swansea's most famous son. Most famous cultural figure: Dylan Thomas wrote Do Not Go Gentle Into That Good Night as well as And Death Shall Have No Dominion. He also included poetry in his play for voices, Under Milk Wood. A year of celebrations will take place in 2014 to mark the centenary of his birth. Other famous cultural figures from the Swansea Bay region include the actors Richard Burton, Sir Anthony Hopkins, Catherine Zeta Jones and Michael Sheen, writer Russell T Davies, and the comedians Rob Brydon and Sir Harry Secombe. Most notable gallery or institution: The Glynn Vivian art gallery, which was built in 1911, is due to re-open soon after a two-year closure for a £6.7m upgrade. Other notable locations include the National Waterfront Museum, Taliesin Arts Centre, Brangwyn Hall, the Patti Pavillion concert hall built by 19th Century opera singer Dame Adelina Patti, the Dylan Thomas Centre and the Hafod Copperworks, the largest copperworks in the world during the 19th Century. Out of Swansea, Neath's Gwyn Hall, the Aberdulais Falls waterfall which was painted by Turner, Richard Burton's house and Merlin's Oak in Carmarthen are also notable locations. Why they should get it: Actor Michael Sheen is backing the bid. "Culture for us here in Swansea Bay is the ordinary - it is our way of life, it defines us and we define it," he said. "But what is ordinary for us here in Swansea Bay, I believe is extraordinary for others. Our outstanding scenery; our proud industrial past; our cultural assets; our creative, clever resourceful people; our premier sporting achievements - all of these things provide a unique culture which I am extremely proud to be a part of. Now is the time that Swansea Bay got its chance to shine and show the world what we're all about."